Unifyed Student – Admit is a complete student recruitment platform designed to help higher education institutions in automating their entire student recruitment process. It helps in improving overall communication to engage students, derive meaningful insights, and simplify other admin tasks. A powerful student recruitment CRM that comes at competitive pricing. Unifyed Student – Admit’s direct integration with SIS eliminates any possibility of data duplicity. So, no more manual data extractions and recordings in another system! A complete dashboard to give you an umbrella view of the entire recruitment cycle, including status of each prospect, applicant, and admit based on the set-filters such as location, major, recruiter, etc. Admissions made simple yet effective! With the help of easy-to-use CRM as Unifyed Student – Admit, institutions can up their recruitment game without investing additional resources in learning and training. Define rules to automatically assign a recruiter or counsellor to a prospect or an applicant. Example: Assign a recruiter to a prospect based on his demographic. Create and automate rule-based communication correspondence plan for prospect, applicant, or a successful admit for each stage of recruitment cycle to engage students. Institutions can remind applicants to keep a track of their application status using a checklist of tasks, enabling them to move on the next stage of recruitment cycle with the help of automated timely notifications or correspondence for pending items. 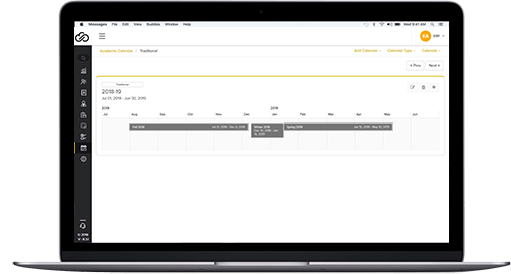 Multiple calendars for multiple programs; segregate your data for prospects and applicants based on set rules. Collate and fetch student data and information under one repository using manual, self-service or through migration. Ready To Experience The Next-Gen Student Recruitment Solutions?